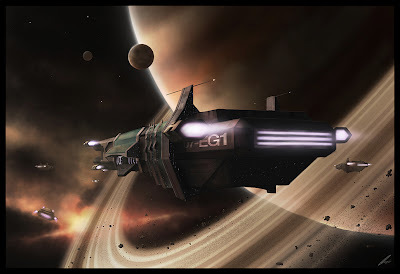 Dan Absalonson | Author of SciFi & Fantasy: I Found Artwork for my first Novel! I Found Artwork for my first Novel! I'm an artist. I can do 3D and Photoshop and all that stuff. I've created eBook covers for others. So of course I'm going to make my own book cover right? Well I was going to, but at this point in my life - I barely have time to write. So I've been surfing images at Deviantart.com for the past month or so, and I finally found THE image for my first novel release. The ship is somehow exaclty what I describe in my book. The perportions are dead on, there's a huge chuck of ship that's cargo area in the back - it's perfect! I asked Eric the artist if I could use his amazing artwork for the cover of my book. He said that I could, all I have to do is send him a copy of the book when it's done. I will send him a signed copy in the mail, and email him all the eBook formats. A small price to pay for his breathtaking piece of artwork to go on the front of my novel. Click on it to see it in a larger size. If you're interested you can see the process he went through to create this piece here, something I'm always interested in being an artist myself. So thank you Eric! That is a really cool picture, and that it matches is even better. Great find! How cool that he's just doing it for a copy of your book? Nice work, Eric! Yeah. I'm really excited about it. It makes me want to stop writing my NaNoWriMo novel and finish this one! :) Eric is a generous dude. Thanks Tim for your kind comments. It's November which means NaNoWriMo!